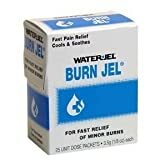 Order it: – Water Jel Burn Jel, Pain Relief 25 ea | Medical Supplies and Equipment. Cools, Soothes & temporarily relieves pain due to minor burns. My husband had part of a load of hot asphalt dumped on his bald head. Asphalt is usually 300 degrees. They used this product after they had brushed off what they could. He came home with no blisters, no burns, and not in pain. No kitchen, shop, or house with a wood stove should be without it!!!!!!! It should be in your camping gear as well!! This stuff is amazing! I was given a sample of it last year at Disneyland after getting a bad sunburn. I hurt so bad I thought we were going to miss a day of playing. When we got back to the hotel, I put this on and almost immediately the pain was gone. The next couple days I alternated between sunscreen during the day and this at night and you couldn’t even tell I’d ever been burned. Amazing product! Overall, the best thing about it is the instant pain relief. I purchased this because I was lucky enough to have a sample of it on hand! I was cooking and put my frypan into my oven to bake a dinner. After I removed it from the oven and placed it on the stove top, I grabbed the handle and lifted the pan before realizing it was the pan I just removed from a 400 degree oven. I had a sample of this gel and put it on my burning hand. First, it stopped the pain in about 30 seconds and next it somehow stopped my hand from even blistering. It was as if I never touched the pan. I can’t explain how magical this stuff really is!